In 2005 Alaskan Diane Benson needed to see her Congressman. She was in DC on her way to Germany to visit her son, who volunteered to defend America after the attacks of 9-11. He was terribly injured in Iraq after he was "stop lossed". Like so many of our soldiers he was compelled to continue to serve indefinitely after honorably and bravely fulfilling his commitment to his country. So she went to see Don Young, her US Representative and one of the most powerful politicians on earth. She wanted him to know about the damage caused to our troops by stop-lossing. He would listen. Members of Ms Benson's family had fought in every war since WW I. Congressman Young treated it as a photo-op - with the parents in shock and Don between them, smiling for the photo. He promised to visit her son but never did, nor did he during that entire period ever visit any Alaskan wounded at Walter Reed. Upon her return to Alaska she did what any mother in her position would do. She ran against him in the 2006 election. (Of course he refused to debate her.) She stunned the pundits by getting forty percent of the vote. It was the beginning of the end for Alaska's Teflon Don. This year Benson and three other strong candidates will challenge Young, whose campaign and career are in a tailspin. How did it happen? Why will he almost certainly lose his seat this fall, the seat he has held so easily for over three decades? And what was on the Don's priority list in 2005, if not the Purple Heart soldiers from his own home state? Well, world class golf, for one thing. As Chair of the House Committee on Transportation and Infrastructure the Don had the power to hold up progress on America's highway spending bill, and for two years, until its passage in 2005, he did just that: keeping the bill in limbo while he traveled from state to state meeting with lobbyists and collecting money. His campaign moneybin was filled to the brim by an endless line of corporations vying for precious "earmarks": tacked on language that steers federal funding to specific projects. The Don's favorite form of fundraiser is the golf "tournament", like his annual event at the Robert Trent Jones Golf Club, and the one held at the ritzy Homestead Resort, both in Virginia. His campaign fund and Political Action Committees sucked up $240,000 at these and other events from a single contributor: STAR Solutions, a consortium of companies with a scheme to build a toll road for trucks. Virginia's I-81 highway was overstuffed with trucks. STAR Solutions wanted taxpayers to help fund 325 miles of truck lanes that they planned to run as a business by charging truckers a toll at either end. So in 2005 Young added an earmark directing 100 million dollars to the truck toll road project. The problem was nobody asked Virginia if they wanted a toll road. The states's Transportation Secretary, Pierce Homer, said all they needed was extra lanes on the existing highway so trucks could move over and allow cars to pass. And the problem for states like Virginia is that the earmarked money is not only diverted from priority projects, it rarely funds the pet project fully. Often states are put in the position of ponying up most of the money for roads they never asked for. As a result many of these projects are not started at all, because states don't want to use their cash on low priority roads. Because of this about half of all earmarked projects in the United States are not done at all. And because the earmarked funds take away from priority projects the states have found it necessary to hire their own lobbyists to battle the corporate lobbyists, and to pay them very well indeed. It is in this business that you will find former Congressman Tom DeLay. In a recent speech the Don said: "None of those earmarks were ever put into a bill that wasn't asked for, including in Florida, and I want you to understand that." His reference to Florida is a telling one. He stuck over 100 earmarks onto the 2005 bill at the very last day, almost assuring that there would not be time to review them. But one earmark- ten million dollars that was to be used to widen a Florida highway- was put in after the passage of the bill. A clerk erased "I-75" and wrote in "Coconut Road Study", much to the puzzlement of Florida's transportation officials, who would rather have a wide road than a narrow study. This might very well be the earmark that broke the Don's back. As I lean into my laptop to watch a grainy cellphone video of the seventy two year old Don regaling a room full of similarly senior supporters, I seem to see a weary slump in his padded shoulders. The federal investigation into the "Corrupt Bastards Club", Alaska's infamous network of influence peddlers, is lapping at his doorstep. For the first time in many years he will actually have to campaign for his seat. Does he feel the groundswell under his feet? Does he realize he will soon be swept out of office like Alaska's equally arrogant former Governor, Frank Murkowski? His grizzled smirk certainly hasn't lost much of its curl. "Go ahead and try to beat me" he says to the roomful of martini drizzled octogenarians, "Have at it." "There has never been a bridge that ever went anywhere, including the Golden Gate Bridge, the Bay Bridge, you name it. Until you got to the other side, and then it went somewhere." "Senator Stevens, Lisa Murkowski and myself; we are the second biggest economy in the state." The Great White Whale of the House wants us to think that come November his political foes will be pulled down like Ahabs, their shattered harpoons festooning his broad back, unable to penetrate the blubbery protection of his campaign fund. Despite the growing clump of lamprey lawyers that cling to his side, his tiny eye tries to glint with confidence. But these days Young's legal bills are sprinting way ahead of the political contributions that pay for them. Historically his campaign fund likes to hover at about a million and a half dollars, even though Ms. Benson was his first serious challenger in decades. That fund paid out $854,000 to attorneys last year. He won't say for what, but investigative piranhas from the Justice Department are nipping at him from all sides. His campaign contributions last quarter amounted to just $43,850. This does not seem sustainable, even for the Godfather. Alaska's Five Families are under attack by the FBI and the soft cutbank under the feet of many of the state's old school political elite is eroding fast. Fixers and hitters from the oil service company Veco are rolling over quicker than schnauzers at Westminster. One of them, Rick Smith, has told investigators he helped funnel cash to Young through bogus invitation only "golf tournaments", which Young invariably won. The man sure loves golf. And money. 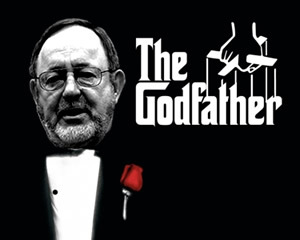 But his time spend as the Godfather of Earmarks will come back to haunt him hard. Like telltale hearts hidden under the floorboards, the earmarks he buried in the Transportation Bill will be his accusers. And their thump grows louder.